Want to create a beautiful mini-wildlife sanctuary that is beautiful year-round? Maybe provide some valuable food for pollinators and save the bees? How about making a natural bird feeder just outside your window? The growing interest in saving bees, butterflies, and helping wildlife has dovetailed nicely with our family’s journey. As over the last two years we have created our own version of a micro-prairie in our backyard (at each house we lived at, and our in-laws). Using a mixture of native plants consisting of perennials, grasses, and some annuals we have transformed a portion of our boring lawn into a flowering sanctuary for bees, butterflies, and even providing some nesting cover for ground-dwelling birds! What’s best about all of these flowers? Their beauty and value to wildlife of course! Furthermore, our sample designs and plants we’ve listed will keep at least some of the prairie blooming all year. For the main part of summer, your micro prairie will be packed with color. Furthermore, these are all species that are pretty easy to grow from seed, so the cost for these plants is pretty minimal. Another nice thing about micro prairies is that it is so easy to experiment and change it up. If you really want to try a species not listed, or modify the layout, it is very easy to do so in fall and early spring while everything is dormant. It is the perfect gardening lab for you. Wouldn’t it be nice to make a little prairie in your backyard? It’s never too early to start planning your garden! You can start in the Fall or even during Winter. Fall is a great time to go collect flower seeds to germinate the following Spring. You need to determine how large of a prairie you wish to have, and where to put it. To choose the location, think of how prairies are naturally in the wild – sun sun sun! You should select the sunniest area of your yard, or at least an area large enough to support 15-20 plants. You need to ensure that the area will receive sunshine for at least half of the day. How big of an area do you need? My recommendation is to make the micro-prairie a few feet bigger than you think you need. My reason for suggesting this is that the more plants = more blooms, which means more pollinators and birds. You will likely find yourself trying to squeeze in a few more plants once you get to planting. But of course, you can always expand it at a later date. Second year plants in our micro prairie! Bee Balm, Early Sunflower, Tall Sunflower shown. What are the soil conditions? Check the soil in the area where you think you wish to start your prairie! Determine if it is dry, wet, or in-between. Also, if you are unsure, go out and take a spade full of dirt. Then, see if the soil is clay-like, sandy, or nice black loam. This will help ensure you pick plants that can thrive in your soil conditions! Dry soils are dry all summer long. If you find your soil to be very sandy, or rocky and drains extremely well, then the site could be considered dry. Medium Soils have good drainage, in that they don’t have water puddle up even after downpours. They will have clay or loam, and drain well. But, they will also retain moisture. Wet soils are just that – wet. They will have water puddle up and stay for a period of time (several days) after rains. They do not drain well. You need a yard, or an area that you have been given permission to plant flowers. Once you have determined your area, it is time to remove the grass. There are several ways to accomplish this –mechanical, smothering, or chemical. If you are tearing up a lawn with few weeds, then this will be easy. However if there are lots of weeds – you may need to comeback to pull weeds, as some have deep roots that will send up new shoots. Removing grass by hand or machine is the fastest way to clear the area for planting. If you are going to be tackling a large area, 50-100’ long then renting a sod cutter would be a good choice. Or, if you are frugal you can attack it with a flat shovel/garden spade. The video below shows my method for removing the grass with a shovel, and it is quite effective and quick. It is much easier on your body than you may think, so give it a view. You might be surprised as to how quick you can clear an area. 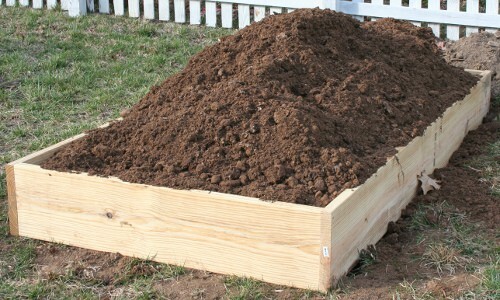 Doing this will remove the top 2” of soil, and will introduce minimal weed seeds. However, if you do have significant weeds in your lawn, then it is likely that you will still have some weeds present. Many species have deep taproots that will re-sprout even if the top 1-2 inches of root is removed, such as thistle. I don’t recommend using a tiller to remove the grass. This is because you won’t actually remove the grass completely, as quite a bit of it will sprout right back up. In addition to grass still being present, you will churn up old weed seeds and allow them to germinate/compete for space. Another effective means, although it can take a month or more is to smother the grass. Use plywood, cardboard, or even a tarp/black plastic sheet to cover the grass. Then just weigh it down with bricks, rocks, or some other means. After a month or two you should be left with soil. If you are going to do this method, I recommend starting it in the fall and leaving it covered all winter into spring. Another means to remove your grass is chemical. Spraying some form of non-selective herbicide will kill all plant life. However, you will have to do it several times spaced about a month or two apart. This is not something I like to do, as I prefer not to use pesticide or herbicides if at all possible. Since this method takes multiple applications, I would prefer the smothering method over chemical. What Plants do you need? Choosing a diverse selection of native plants for your micro-prairie is key to having success. You should always pick plants that are native to your area, as they have evolved over millennia to fit with your local ecosystem. This includes both flowers and grasses. Choose these plants based on what your conditions are – wet, dry, medium – clay, sandy, loam. It is possible to make a prairie without grasses, but I don’t recommend doing it. The grasses add much interest later in the season, and can keep the area looking beautiful through the winter. Additionally, they can provide cover for small wildlife and birds. Furthermore they can take up ground space that would otherwise be filled by weeds (as weed seeds always blow in throughout the year). A good rule of thumb is one grass plant in-between flower species, or every third plant. One other benefit of grasses is that they will provide support to your flowers. Some flowers can grow tall and be prone to getting knocked over by high wind or storms. Some get tall and top-heavy enough that they can do this without the wind! Having the right kind of grasses in the right locations will help keep the flowers upright. Here is a small sampling of plants suitable for dry areas. If you wish to compliment them with some others that like moisture more, well then you just need to ensure they get water and that the soil doesn’t drain too much. Below is a sample of plants that do well in soil that drains well, but retains its moisture. I’ve sketched up some rough designs linked below. These could be good starters to give you some ideas as to how you should design your prairie garden. Click on the image to be taken to a full resolution. This design places all of the tall plants in the ‘back’, or North side of the micro prairie. This is important, as their height will create shadows for anything behind them. Thus, all plants in this design would receive the necessary amount of sun. An example of a micro prairie that fit into the corner of your yard, possible against a fence. Again, this design places the tallest plants behind shorter plants, relative to the South, or sunlight. One of the primary principals in any flower bed design is to ensure that taller flowers don’t shade out smaller flowers. Don’t forget this when designing your micro prairie. I highly suggest you purchase some grid paper to make your design, as it will allow you to play with different concepts until you are satisfied. Also, don’t be afraid to experiment. And don’t be afraid to ‘take liberties’ when it comes to spacing grass/flowers. The more compact your micro prairie is, the fewer unwanted weeds you will have. For me, the key to having a full, successful prairie is to have color for as long as possible, with as little maintenance as possible. To achieve this you should note that I don’t allow for many gaps in the garden design. Now, when starting new plants, initially there will always be gaps. But after a year or two when the plants have had time to fully mature, these gaps should disappear. You should also note in the layouts that I have made the tallest plants in the ‘back’ of the garden. This way they won’t shade out the smaller flowers. So, place the tallest plants in the most northern area of your prairie. This way you can enjoy all of the flowers throughout the season. How long does it take to get established? You should expect at least two years for a prairie to get established. Some plants, such as Blue False Indigo can take up to five years to reach full size. But it is worth the wait. Choosing a selection of plants that provide color all season long and allowing them to fill in can make for a beautiful low-maintenance flower bed that is loved by the ecosystem. But, if you provide the right conditions for the plants and start early, there is no reason your prairie can’t get established in just a couple of years. See an example below of a native flower bed/prairie that we built for some relatives. They were tired of having to pull isolated weeds from a ‘manicured, mulched’ garden and wanted something that was low maintenance. When they saw all the bees and butterflies it drew in they were even happier! Micro-Prairie, Year 2 – complete transformation! How do I get the plants? There are two methods for doing this – buying them or growing them from seed. For purchasing plants, your best bet is to seek out native plant sales in the Spring and Fall. These are typically done through non-profits, or statewide native plant societies. They generally have the widest selection and the sellers will generally be very knowledgeable! Also, there are specialist native plant nurseries around, but again – you need to seek them out! So don’t be afraid of google! Native Plant Sales help local nurseries who care about the environment! By far the most economical way to build a micro prairie is to grow the plants from seed yourself! Now, this does require some planning as the seeds for many flowers need to go through, or experience a simulated winter called ‘stratification’. Think of it like this – flowers set seed after they have finished blooming, and for many species this is in the fall. So a seed that is dropped by a flower will sit in cold soil all winter long before germinating in the Spring. within a couple weeks, typically. For plants that don’t require stratification, then just plant them in starter pots. You can use other containers as you like, as long as you poke holes in the bottom to allow for drainage. I love using the large 1 quart yogurt containers, as then I don’t need to transplant a seedling into a larger pot, as it is already there. supplemental water if they are in small pots/6-packs. If the dirt looks dry, and the pot feels light, give the seedling some water. Once the plants are 4”-6” (10-15 cm) tall, they can generally be transplanted out into your prairie. You should consider placing a short bamboo stake next to any plant you place into the garden. That way you are less likely to mistake the plant for a weed the following Spring. Eventually, you will be able to identify new shoots and seedlings of your species by sight and this won’t be necessary. During the first couple of years your prairie will require the most maintenance. Random weed seeds that blow in will germinate, and you will need to pull them. This is even if you add mulch. Most weed seeds come in from the air, so weed prevention mats cannot stop these. Once your plants and grasses grow to maturity, they should fill in most gaps. This will result in a beautiful meadow that will be buzzing with wildlife all year. And, because of this there will be few weeds. But, keep up with it and you will save yourself much trouble. For the first couple of years, rabbits and deer can pose a significant threat to ‘some’ of the young plants until they get fully established. To keep them away, I highly recommend some kind of repellent. I personally use LIQUID FENCE. I buy the concentrate bottles and follow the application instructions. Giving a 3-6’ perimeter as well as spraying on the plants directly. I apply weekly for the first month after leaves emerge, then every three weeks. If we get a big rain, I will apply it afterwards too. But once the plants get a bit larger, most of the plants don’t seem to be in danger. I guess perhaps the leaves of older growth don’t taste as good. Once the plants are firmly established and healthy, they can survive rabbit and deer browsing pretty good. Also, there is no need to cut back the flowers after blooming. Birds will eventually arrive to begin eating the seeds out of the dried blooms, or seed heads. In addition to this, some butterflies over winter on the stalks (for example, giant swallowtail). Also, some beneficial insects will burrow into the stalks/stems. Another benefit to leaving the grass and dead foliage is that it is beautiful in the winter. A prairie covered in fresh fallen snow is a sight to behold! Micro-Prairies can make a beautiful Fall Display! One maintenance item you should consider is if you plan to expand your micro prairie, you should consider saving some of the flower seeds. Most will develop by October. But you can collect seed from your spring flowering plants much sooner. This is a very cost effective way to expand your micro prairie, or even to just share with friends. You should wait until spring has arrived to cut back dead foliage. I generally wait until I have mowed my lawn the first time. That way I can be pretty sure that any hibernating insects have left, and I’m not accidentally killing them. Also, you can leave about 1’ of the stalks standing up. They won’t inhibit new growth, and they will also help support the new flower stalks during the summer. I hope you enjoyed this post, and that it gave you a bit of inspiration and ideas! Every native plant sown in your garden helps our ecosystem. And a micro-prairie helps it 10X more! So, I hope that you feel inspired to go get dirty and get started building a micro prairie! If you want to stay up to date with us, sign up for our email list. We only send you updates when we feel they are pretty substantial! DON’T MISS THESE OTHER ARTICLES! I absolutely loved this, great job and full of information! Wow! Thank you so much!! We really appreciate the feedback!!! Hope all is going well at https://www.facebook.com/crimsoncloverflowerfarm/ We love following along! !